What do I do if my child is struggling with reading? Hope you win the lottery. Seriously. First, I’m so sorry. It’s painful. 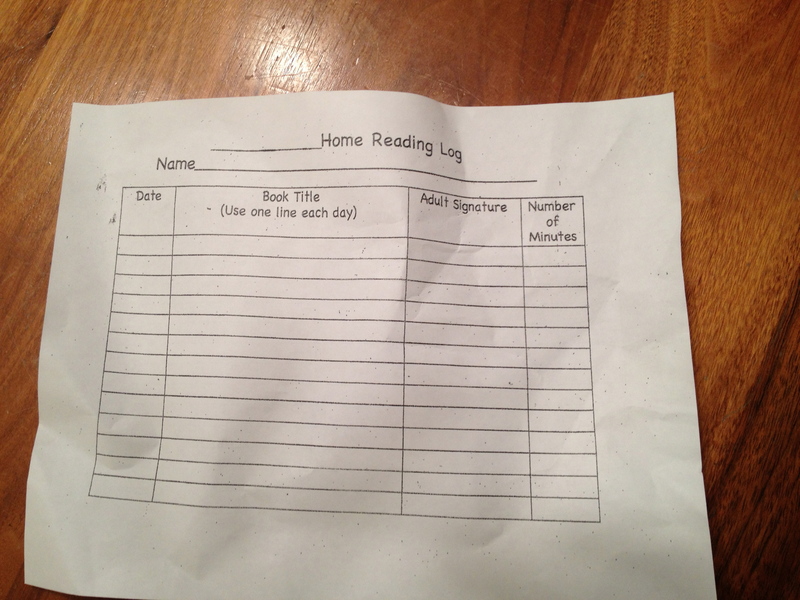 It’s difficult to have your child’s independent reading sheet look like this. You begin to wonder what you did wrong and what more you should have done. Listening to others talk about how their kindergartener is reading and equating that to intelligence or fantastic parenting or how often they brought their child to the library can be heart wrenching , especially when you thought your child was kinda smart, you were and OK parent and you have enough library fines to prove you do in fact visit libraries. You wonder what is wrong with your child that should be on the road to reading, but for some reason is just not getting it. The child that you thought was so normal in preschool is suddenly struggling and you feel like you are in the middle of an incredibly slow moving train wreck. As the parent of this child, you need to find some resources and educate yourself about what dyslexia is and what it isn’t. A great book is Overcoming Dyslexia. But beware, if you are like me you can read a book on ANY SUBJECT and start diagnosing yourself, your children and especially…your spouse. A related website is the Yale Center for Dyslexia and Creativity. There is a lot of great information here about interventions and advocacy. Your first resource should be your child’s teacher. If you have a good relationship with him/her and you trust them, be very honest and share your worries, observations and fears. Everyone learns to read at different times. If you child is behind, but making progress, its possible they are just a late bloomer. But, if interventions have already been tried, no progress is being made, and there are no other reasons why reading should be struggle then its time to look for help. Another good resource is your pediatrician. These people see a WIDE range of children and many times have a good feel for when to worry and when not to worry. Many times doctors have a good educational psychologist they can recommend if this is the direction you should go. If you live in the Twin Cities, I suggest people contact Groves Academy. It’s very expensive, but you can trust they are going to do a very thorough job assessing the strengths and weaknesses of your child and helping you come up with a plan. I believe that going to an educational psychologist is very important for learning disabilities. Sometimes a neuropsychologist or something who works more in a hospital setting doesn’t have the educational background and they give a different battery of tests and someone with an education background. #2 was tested twice within months of each other with VERY different results. The difference came with the educational psychologist giving him a phonemic awareness test, whereas the neuropsychologist left that out. Without a test on phonemic awareness there is no way to diagnose dyslexia, since this is one of the telltale signs. Sadly, if you rely on the school district, many times the help your child needs can take months or even years. Of course, you will still need to go through the school district to get direct help from them, but if you already have an assessment in your hands from an outside source, many times teachers will use this information for accomadations, interventions and to move a 504 or IEP forward. Another word of advice, find support, especially from other parents who understand the pain of having a child that struggles in school. Having a child that struggles can be very isolating. It’s really easy to feel judged, because, let’s be honest, there is a lot of stigma that goes along with having a child that is struggling in school. If you can’t find someone near you, keep checking back with this blog! One of my goals about being so open with my journey is to help other parents know they are not alone. Last word of advice….go for a run. The marathon is 9 days away. I have reached rest week. Now I sit, sleep and eat for a week and get filled with nerves and questions of “What have I gotten myself into?” Long runs are done. Hill drills are done. Track workouts, tempo runs, pace runs, long mid-week runs….all done. The workout routine that I have come to love and rely on over the last year will take a break for awhile. My overall goal has been achieved, which was to make it through a year with no major injury. I have successfully come back from my major stress fracture and completing my second marathon, no matter my time, will be the icing on the cake. On my last fast run this morning one of my running partners asked how I felt my summer marathon training had gone. I commented that I could tell I had spent all winter and spring working incredibly hard to gain strength and endurance. Last fall I worked hard to relearn how to run with my very condensed stride. I had to concentrate on every step I took so I didn’t slip into my old habits. During my marathon training this summer I never felt as tired as I felt last winter when I was doing yoga, skate skiing, running through snow drifts and forcing my body to do things I never thought possible for me. #2 has also come back from an injury. Both of us were crushed by his school experience, never knowing if he would re-enter a school after basically being told “we don’t know how to teach you and we don’t want to figure it out.” At my last meeting with the staff the defining moment came when they told me they didn’t believe it was possible for him to read and write (he was only in 3rd grade at the time). #2 was so downtrodden that he also never believed he would read or write. We have worked for 1 1/2 years to build up his strength and confidence and prove his former school (and himself) wrong. I worked long and hard teaching him how to read and write….and most importantly how to believe in himself again. We started at the beginning, going over the letters and their sounds. We worked longer and harder on basic reading, writing and math skills than I ever thought was possible. He wrote paragraph after paragraph working on his form, spelling and trying to get faster and more automatic. He read book after book out loud working on his decoding strategies, comprehension and reading fluency. Near the end of the summer I decided it was time to send him into the world. Because of all his work, his basic skills are much stronger than I thought was possible a couple years ago. He can decode a word, understands how English works and can discuss what he has read. The overall goals of homeschooling were met. He learned to read at grade level, believes he is a reader, has the confidence and ability to express himself in written form, and is able to get spelling close enough for a spellcheck to help him…most of the time. His work on the basic skills was done and it was time to apply them in a less controlled environment and work on some new goals, so I enrolled him in school. He now attends Cyber Village Academy, a small charter school close to our house. Like all the students on campus, he is at school 3 days a week and at home 2, which seems the perfect blend of homeschooling and traditional school. Much of the reading and writing take place at home, on a computer. We still tap out syllables for spelling, remind him about the -ed suffix, and I modify the work that isn’t appropriate for him. 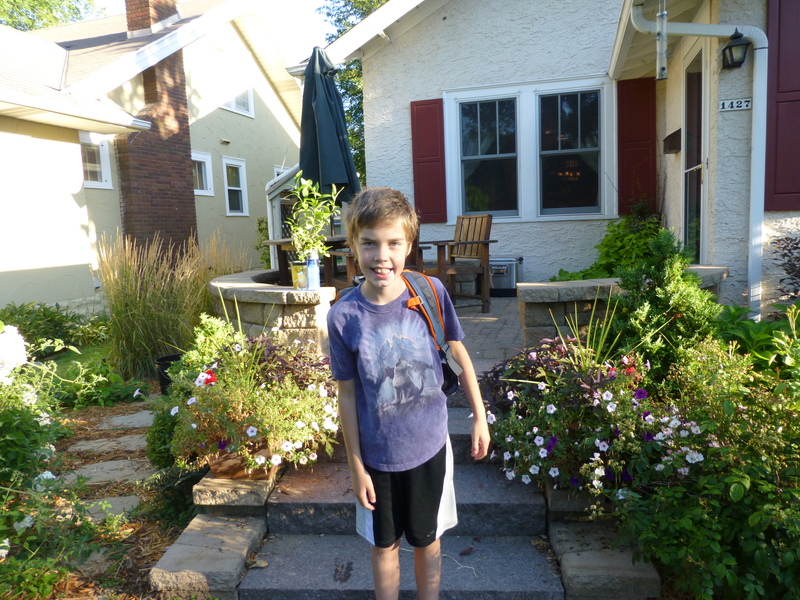 I have had his first IEP meeting and they are working on his main goal of self-advocacy at school, a goal that is pretty difficult when your mother slightly stubborn mother is your only teacher. The week before I sent him off to school we had a rest week at home. I was filled with anxiety. Would he be able to do this? Has he prepared well? Should I have drilled him more on vowel-consonant-e? Will he be able to keep up? It was time for me to trust again and rely on the work we have done. Trust myself. Trust the school. Trust the teachers. And, trust #2. #2, Are you ready for this? It’s going to be hard. There will be times when you want to quit. You will need to constantly remind yourself that you have worked hard for this moment and you want to be here, especially when its hard. I will be here to help you and encourage you, but its you that will need to do all the hard work. I worked hard and I know I can do this. Let me prove what I know. I’m ready to show them what I’ve got. Now can you PLEASE TAKE THE PICTURE SO WE CAN GET GOING? And with that, he was off. In 9 days I will also be doing something not because it is easy, but because it is hard. I never thought I’d be a runner, but here I am proving myself wrong because of the work I have done, the self-discipline I have learn and the support I have received. There will surely be moments during the 26.2 when I will want to quit. But, there will be smiling faces and words of encouragement along the way telling me I can do this, rely on the work I’ve done for the past year, and remember to trust my body. It’s time for me to show myself what I’ve got.